Children and Shinjuku High School baseball team members playing in the field gather to hold hands and get one out during a make-believe baseball game in Tokyo’s Shinjuku Ward on Feb. 3. (The Asahi Shimbun, March 4 By SHIRO YAMAGUCHI/ Staff Writer ) In a recent "baseball" game in Tokyo's Shinjuku Ward, the hitter swatted the baseball off a batting tee, then after reaching first base, dashed back for home plate. Meanwhile, after one of the fielders caught the ball he and all his teammates ran and gathered in a circle holding hands and shouted “out” in unison. This offbeat form of baseball was the brainchild of an enthusiastic manager and members of Shinjuku High School baseball team who invented their own versions of the popular sport for younger players. It's their hope to generate more interest in baseball among children, at a time when coaches and veteran players fear for the future of the sport. 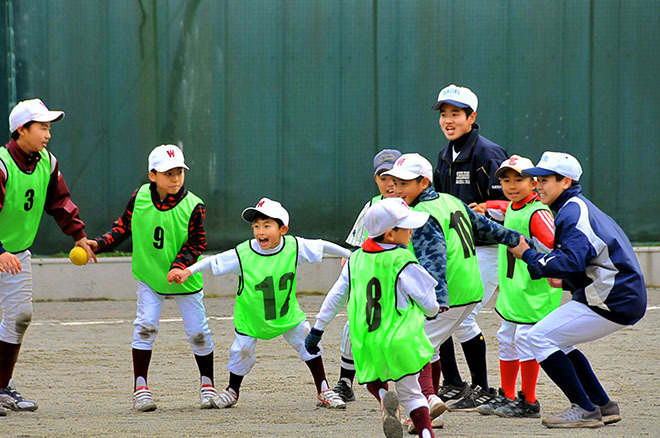 Fourteen members of the baseball team and two female assistants who attend the Tokyo metropolitan government-run high school held the event on Feb. 3 for about 50 elementary school boys and girls and younger children who play on community baseball teams. “Please convey how much fun playing baseball is to your friends who do not play the sport,” said Hiroyuki Takubo, 36, manager of the high school baseball team, to the participants. In the simplified version, the number of outs are not counted, and the at-bats continued until all hitters got a turn at the plate. In the game, batters are not likely to miss the ball since they are hitting off a tee rather than a thrown pitch. Since all members of the opposing team need to converge on one spot, everyone can get involved in every hit ball. They were instructed by the high school players on how to play several kinds of make-believe baseball games that are simpler than the actual game. The location was the high school’s field, which is surrounded by tall buildings including the Takashimaya Times Square complex, a sightseeing magnet for tourists. After the games, the senior players demonstrated their skills, including hitting home runs and throwing fast balls. In addition, they helped the younger players do their homework and taught them how to record their game progress. Parents were given tips by a nutritionist on preparing meals for children who play sports. Meanwhile, coaches of little leagues attended a lecture where a physical therapist talked about preventing player injuries. It is rare in Japan for a high school baseball team to hold such an event on its own. He suggested that most high school players were nurtured by such teams as they were growing up and were taught the fundamentals of the sport while they were in elementary school. “However, we felt that we had not repaid our debts to such teams for their efforts,” Takubo said explaining why he came up with the event. His words also reflected a feeling of crisis for the plunge in the number of youths playing baseball today. The number of junior high school students who play baseball with rubber balls is dropping at a pace eight times faster than the declining birthrate, according to a source. The loss in popularity is not simply due to the falling birthrate, as fewer children today play baseball or even toss a ball back and forth in their neighborhoods. Takubo has his team practicing long and hard hoping for a spot in the National High School Baseball Tournament, which is held in the summer at Koshien Stadium in Hyogo Prefecture. Still, he has time to reflect, “The world of high school baseball is somehow self-enclosed. What will be left (for students) after focusing on practice (of baseball), then being defeated? Takubo was delighted to see his players’ growth in another aspect than what can be seen through their practices.